The deadliest new weapon for mass killers doesn’t require a background check and it is available to anyone with a bad temper, a tank of gas and a lead foot. There are many videos of the event, including one from RT that may be viewed here. 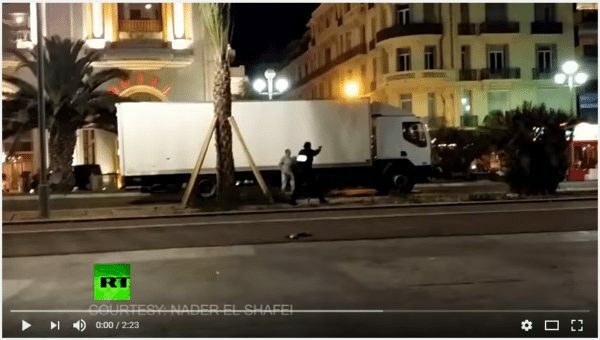 It shows French police shooting the cab of the truck to pieces, and the aftermath. Liberals can’t blame weak gun laws for the carnage because France has restrictive gun regulations. That didn’t stop Bouhlel from reportedly having an arsenal of guns and grenades, so that’s another negative for the liberal narrative. As Matthew Cochran wrote the other day at The Federalist, America doesn’t need or want liberals to be dictating gun control, anyway. He makes a solid case in an essay that should be required reading for every member of the mainstream press. Among the victims of Thursday’s mayhem are a father and son from Austin, Texas. Sean Copeland, described as the vice president of a software firm, and his son, Brodie, were on a family vacation. In ancient times, one didn’t dare harm a “citizen of Rome.” Some people suggest that should be the standard for America today; harm a U.S. citizen anywhere in the world and suffer the consequences. Perhaps the “new norm” for Americans will have to include mental preparedness to get out of harm’s way, in this country or anywhere one travels abroad. For example, always have an escape plan, which includes knowing where exits are located from anyplace one happens to be. Take a first-aid course. Practice what some people call “situational awareness,” which includes not walking around with your eyes focused on the screen of a smart phone. Instead, pay attention to what goes on around you, whether at a shopping mall, grocery store, public celebration – such as this weekend’s “Bite of Seattle” – or any other venue that may attract a crowd. The world will learn a lot more about the death truck driver. French authorities have reportedly taken Bouhlel’s wife into protective custody. The couple was either in the process of divorcing, or had divorced, and the wife’s cousin has told the Daily Mail that Bouhlel was a nasty piece of work who drank alcohol, beat his wife and did not attend a mosque.